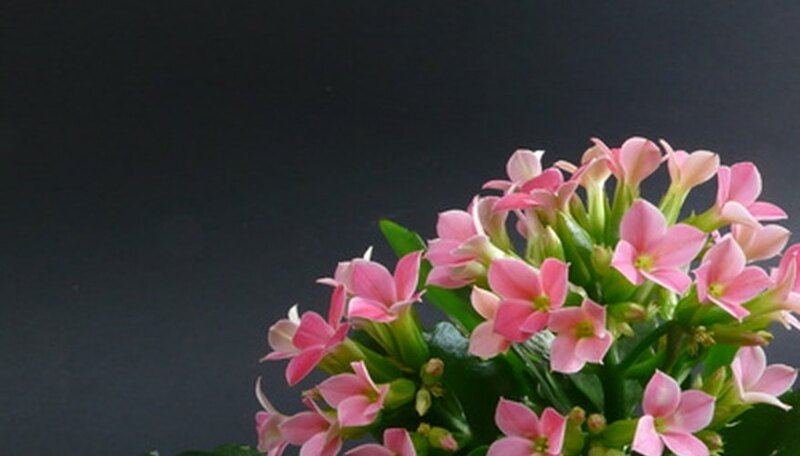 Kalanchoe is a succulent flowering plant that is native to Madagascar. The plant produces small flowers with four pointed petals on each blossom. The flowers come in a range of colors, including red, orange, pink, violet and white. The plant is propagated by taking cuttings off the mother plant. Cut a 6- to 8-inch piece off the kalanchoe mother plant during the spring months. Kalanchoe's growing season is during the spring, so this is the optimum time to propagate the plant. Remove the leaves from the bottom 3 inches of the stem cutting. The result will be a few inches of leafy stem, with a bare-stemmed bottom. Allow the cutting to dry out for three days. Kalanchoes are succulents, which means that they store water in their stems and leaves. The cut end's wound must heal before it is planted. If the cutting is planted while the wet wound is still open, the cutting is vulnerable to rot and disease. Fill a flower pot with cactus potting mix. Kalanchoes do not like wet roots, and the cactus mix provides the proper drainage. If you don't have access to cactus potting mix, make your own by mixing topsoil with gardening soil at a ratio of 1:1. Water the potting mix thoroughly. Allow the excess water to drain away for 30 minutes. Create a hole in the center of the potting mix with your finger. Push the bare stem into the soil, leaving only the leafy part above the soil line. Gently tamp the soil around the stem to fill the hole and support the cutting. Avoid overwatering. Kalanchoes are drought-resistant plants, and cannot tolerate excess water. Water the plant only when the top 2 inches of soil are dry to the touch.